There are some interesting parallels to our adoption curve and a leadership model first developed by Paul Hersey and Ken Blanchard: Situational Leadership. While some fault SL as not academically rigorous, it has nonetheless remained a stable of leadership courses (including mine) for the simple reason that it makes sense and works. Hersey and Blanchard noted that most workers start as enthusiastic but non-competent practitioners. They are willing, so they need little supportive behavior, but they lack skills, so they need lots of direction. Blanchard called this the S1 Directing phase. As the workers’ skills grew, their motivation may wane, so they need added support and stroking. This is Blanchard’s S2 Coaching phase. 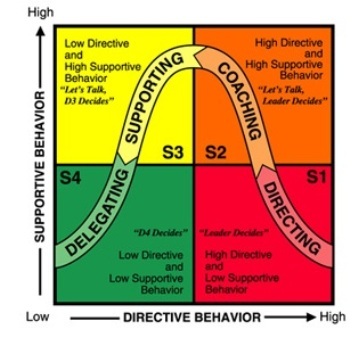 On achieving mastery, the workers may not be confident, so support remains high as directing behaviors are backed off – Blanchard’s S3 Supporting phase. Finally, they can run on their own, and on reaching Blanchard’s S4 Delegating phase, little support or direction is needed. The model is situational in that one might reach S4 in one area but need S1 guidance on assuming a new task. It appeared to me that Jeff, Bud and I all went through the S1-S2-S3-S4 cycles three times this year as we examined, learned and adopted three different technologies for personal use. With delicious last year, blogging this fall, and Twitter in the last month, I was interested and willing but not competent. Jeff provided the necessary direction to help me get started. We three formed our own support group and reinforced each other’s steps and mis-steps as we gained familiarity and confidence with [del.icio.us] [word-press and edublogs] [Twitter and twhirl]. As our abilities grew, less direction was needed and we continued to support each other. Finally – at least for delicious and blogging – little support or direction was needed, as these had become internalized and part of our normal routine. We are still in the Coaching/Supporting phases on Twitter! The lesson for me is that adoption is not a quick process, but rather a continuum of activities, calling for both directing behaviors and supporting behaviors. I am fortunate to have great colleagues that provide that support on a daily basis! When it comes to adoption and incorporation of new technologies, the barrier is getting to the starting line (or S1) in some cases. In the DoD, organizational priorities, supporting requirements and fielded capabilities are purposely directed from the top down to ensure a unified approach across the enterprise. One of the challenges in a hierarchical organization is seeding technology initiatives at the executive level, where position and status are often achieved through careful management of the status quo. The easiest course of action is typically ‘going with what you know’ and sticking to the road well-travelled. While the technology adoption and SL curve may resemble each other, the character of the organization will determine how parallel they are. I’d argue that because of our risk-averse nature in both military procurement and operations, S1 doesn’t typically start until the ‘late majority’ or ‘laggard’ phase of tech adoption in the larger society. Militarily, the US enjoys an asymmetric quantitative advantage compared to our world competitors. The same could be said of the Soviet Union decades ago, but it eventually fell to a more nimble and qualitatively better foe. We may find the tables turned on us some day in a similar scenario. While this is a military example, it would apply to any organization with a risk-averse or change-resistant leadership. To encourage agility, a learning organization has to be led from the top. The CEOs, COOs, Generals and Admirals also need to be the “Chief Learners” to ensure technologies and their strategic, operational and tactical employment are allowed to incubate early and are adopted more quickly when their worth is established. The challenge — from line worker to middle manager — is to support and encourage their seniors’ education. The young deck seamen and mail room clerks of the world are the first to blog, Twitter, bookmark as well as buy the newest games and gadgets. They should be encouraged to push the tools and ideas they gain from those personal acquisitions up the organization. Don’t leave it to the CEO and serendipity.